Anti-creep spacers are designed to provide reinforced clearance holes for bolts to pass through a plastic moulding, and thus allow metal-to-metal clamping forces to be applied to an assembly without over-stressing the plastic. the amount of clamping force applied to the plastic is limited. This prevents the plastic from “creeping away” with time and elevated temperature, which reduces the overall clamping force, allowing the bolt to loosen under vibration. The spacers can be designed for either mould-in or post mould press-fitting, for use with both thermoset or thermoplastic mouldings;spacers can be manufactured in brass or steel(s) depending upon the customer’s application. Every anti-creep spacer or compression limiter has to be designed in relation to the material, type of fastener and both mating materials being used for the specific application. 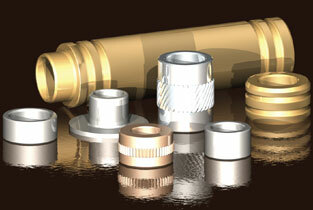 Flanged hexagon headed bolts are the preferred fastener to use with the anti-creep spacers. The bearing diameter under the head of the bolt or washer must be greater than the outside diameter of the spacer to effectively secure the component. The axial retention of the spacer will vary dependent upon the length, diameter and external features of the spacer and the plastic around it.